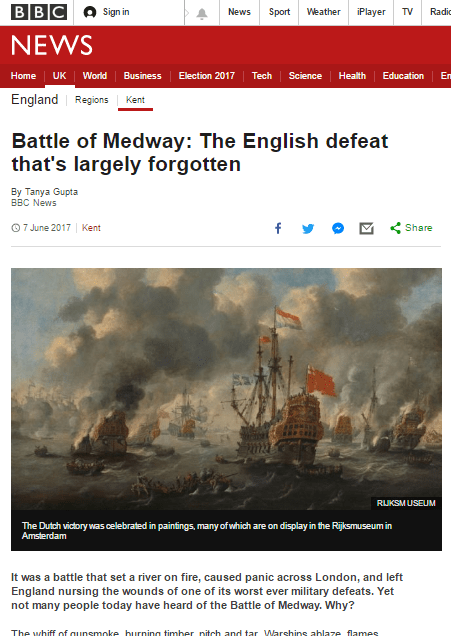 People are getting quite excited about Medway Council’s commemoration of the 350th anniversary of the Raid on the Medway, which includes a series of events leading up to fireworks on the 17th June. Perhaps the most excited group are Dutch yachties, who have long since booked up every space in local marinas and moorings. I expect the Medway’s creeks will be nearly as busy as the waterside that evening. 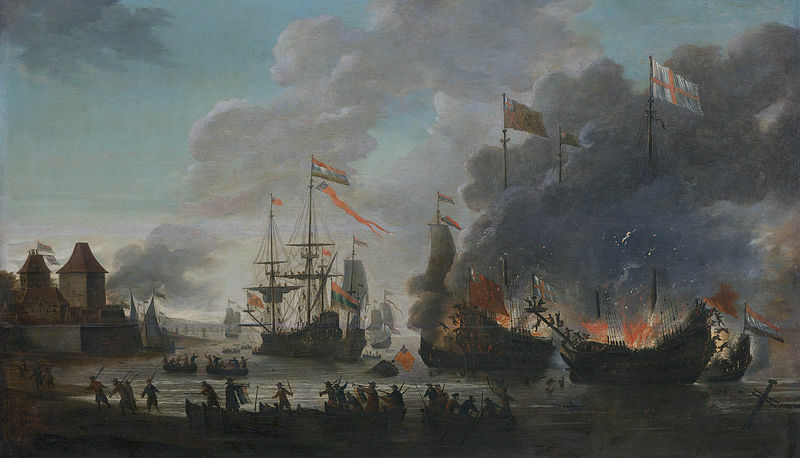 The battle itself was actually a huge humiliation for the English Navy and a daring, in some ways lucky, but carefully calculated success on the part of the Dutch United Provinces navies. There are some interesting short videos to watch on YouTube (one here and one here), but if you really want to understand what happened at Sheerness, in Gillingham Reach and off Upnor Castle (and what is now Chatham Marina, Seaforth Publishing has just released PG Rogers’ classic work on the topic, The Dutch in the Medway. Nab it quick, I say, while it remains on offer, for as well as explaining the background and aftermath, its chapters describing the action is as gripping as it is fascinating – even more so if you’re a North Kent sailor and know the Medway. It’s really essential reading ahead of an event that will be a celebration for the Dutch (who call the battle ‘The Trip to Medway’). For the British it’s a bit more complicated – I’m expecting both a celebration of how our nations now get along well, but also a moment for commemoration and quiet thought about how such a national humiliation was allowed to happen. My take, which won’t surprise many who know me, is that we should never place too much trust in government decision making or propaganda. The background was the second Anglo-Dutch war, which was sparked by continuing rivalry over trade and anger over the torture and the killing of nine British traders at the island of Amboyna by the Dutch. In the period before the Medway, the second Anglo-Dutch war was generally thought in England to be coming to an end: there had been battles and now peace negotiations were taking place at Breda. But it was also a time when state finances were at a very low ebb, military procurement badly managed and payment very slow, Navy vessels unmanned, slow progress in building military defences, and a very small army, and a King who was apparently more interested in the fun of court life than the affairs of state. It was, you might think, just the right moment for a Dutch military intervention aimed at influencing the outcome of the Breda talks. Intervene they did – and this is what Rogers describes so well. With the help of various disillusioned English seamen and military officers, the Dutch sailed up the Thames, took Sheerness and then, aided by a handy NE breeze, sailed up the Medway for two fierce engagements in the narrow waters off Gillingham and Chatham involving cannon fire, fireships, the destruction of a defensive chain, and boardings of English ships defended by unarmed men – some of whom, not surprisingly, chose to escape rather than face certain defeat and very likely death in an unequal fight. The second battle occurred three days later – but by this point the British defence had been strengthened, and the attackers were subjected to heavy cannon fire. The Dutch did not reach and destroy the Chatham shipyards, probably partly because the narrowness of the channel (making navigation difficult, perhaps particularly with a NE wind) and because a number of ships had been deliberately sunk to narrow the channel. By this point a great deal of damage had been done to bthe English Navy’s vessels, its reputation and pride. Ships had been sunk or burned, and the big and symbolic Royal Charles (previously it had been the ship that brought Charles II to England) had been captured. There were attempts at propaganda belittling the Dutch victory, but it seems to have been difficult to hide the truth of a defeat so close to London. And it wasn’t over yet – the Dutch continued to ply the Thames Estuary, preventing cargo ships from delivering good such as coal to London, and terrifying the folks of capital, who by now were half sure that the Army and Navy were in no state to protect them from the apparently fearless, well led and well informed Dutch, who had gained considerable respect. It’s perhaps a minor point, but even the feat of getting the half-rigged Royal Charles down the shallow Medway and safely back to Amsterdam was seen as a great achievement. Once there she was put on show as a prize, which naturally caused great anger in England.